פֿאַר אים איז טעריטאָריאַליזם און בפֿרט פֿרײַלאַנד געװען ניט אַזוי אַ פּאָליטישע באַװעגונג װי אַ נאַציאָנאַל־קולטורעלע. ער האָט באַטאָנט גײַסט־ייִדישקײט אַקעגן "מלוכה־ייִדישקײט" און האָט געשטרעבט צו געפֿינען פֿאַר ייִדן אַ פֿרײַ לאַנד אונטער אַ דעמאָקראַטישן רעזשים און נישט דװקא קײן באַזונדערע מלוכה. לויט אים איז קיום האומה אַלײן ניט געװען דער עיקר נאָר דאָס מאָראַליש–רעליגיעזע שליחות פֿון דעם ייִדישן פֿאָלק װאָס אָן דעם זײַנען ייִדן נישט קײן ייִדן. דער מאָראַלישער פּנים פֿון דער רעװאָלוציע. שיקאַגע, 1951. זכרונות פֿון אַ פֿאָלקס־קאָמיסאַר. װאַרשע, 1931. געלעבט און געחלומט אין אויסטראַליע. מעלבורן, 1943. מיט אײן פֿוס אין אַמעריקע: פּערזאָנען, געשעענישן און אידעען. מעקסיקע, 1951. אין קאַמף פֿאַר מענטש און ייִד. בוענאָס־אײַרעס, 1952. Spiridponova: Revolutionary Terrorist. Translated and edited by Gwenda David and Eric Mosbacher. London, 1935. Australia: The Unpromised Land. London, 1948. In the Workshop of the Revolution. New York, 1953. All these words describe the exceptional person and Jew, Dr. Itskhok-Nakhmen Steinberg, the second editor of Afn Shvel (1943-1957), when it was still the organ of the Freeland League. Before he came to territorialism and to the Freeland League he had behind him a colorful life as a leader of the left SRs (socialist revolutionaries), a folk commissar of Justice in Lenin's cabinet (until February 1918), an intellectual schooled in the best universities of Russia and Germany, and an editor and writer of literary and political articles in Yiddish, Russian, and German. He was a wonderful speaker with charisma and deep humanity in whom the often contradictory ideologies of socialist revolutionary and pious Jew dwelt harmoniously. 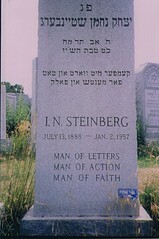 Dr. Steinberg demonstrated that there are select individuals who can, as essayist and educator Avrom Golomb put it, be faithful "to the religious, traditional mode of Jewishness and [...] to secular culture.1"
For Dr. Steinberg territorialism and, in particular, the Freeland League were not so much a political movement as a national-cultural one. He emphasized spiritual Jewishness as opposed to state (i.e. political) Jewishness and strove to find for Jews, not necessarily their own state, but a free country in which they could live under a democratic regime. According to him the most important issue was not national existence itself but, rather, the moral-religious mission of the Jewish people without which Jews were not Jews. In Kamf far Mentsh un Yid [In Struggle for Man and Jew]. Buenos Aires, 1952. Mit Eyn Fus in Amerike. Perzonen, Gesheenishn un Ideyen [With One Foot in America. People, Events and Ideas]. Mexico, 1951. Gelebt un Gekholemt in Oystralye [Lived and Dreamed in Australia]. Melbourne: Frayland-Lige, 1943. Zikhroynes fun a Folks-komisar [Memoirs of a Folk Commisar]. Warsaw: Kh. Bzhoza, 1931. Der Moralisher Ponem fun der Revolutsye [The Moral Face of the Revolution], trans. Shmuel Fridman. Chicago, Berlin: Naye gezelshaft, 1925. In the Workshop of the Revolution. New York, Toronto: Rhinehart, 1953. Australia - The Unpromised Land. London: Gollancz, 1948. Spiridonova: Revolutionary Terrorist. Translated and edited by Gwenda David and Eric Mosbacher. London: Methuen & Co., ltd., 1935.